The MacBook Air ships with software tools that allow users to do without the external drive option for most purposes. Remote Disc, Remote Install, and related technologies that enable the Air to share a network host's optical drive both for reading files, installing software, backing up data, and even booting over the network. Here's a look at the Air's SuperDrive and how well early adopters can expect Apple's software to actually work as an alternative to carrying around a physical SuperDrive. Next to the missing FireWire and Gigabit Ethernet, the MacBook Air's missing optical drive presents the second largest issue for new adopters of the ultra-thin, lightweight laptop. 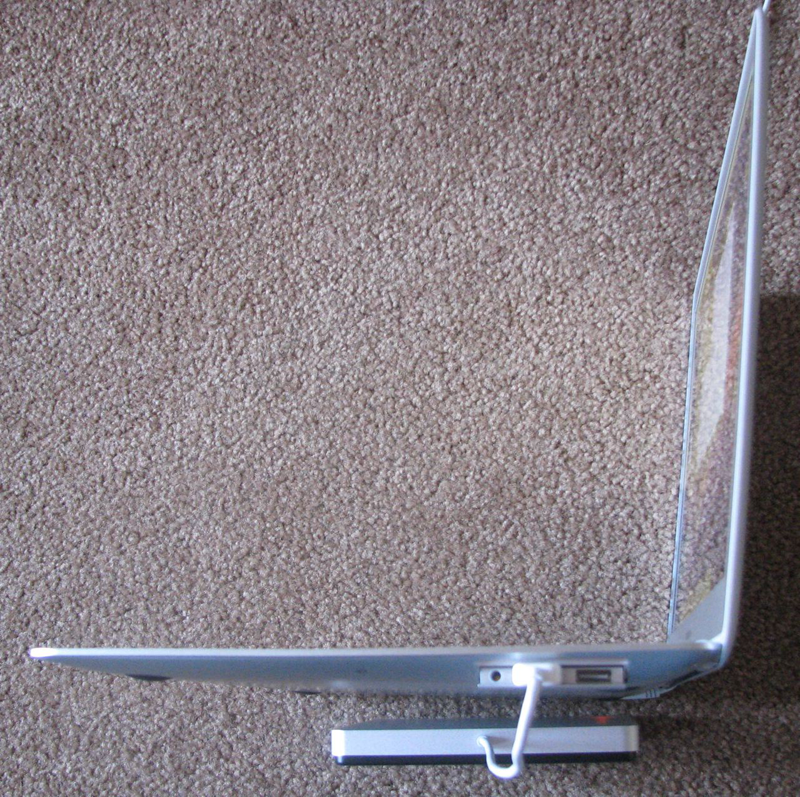 Apart from Sony, which has a reputation for shoehorning impossibly thin optical drives into its ultra small VAIO laptops, most other ultra mobile laptops drop an internal optical drive to shave off volume, weight, and battery consumption. 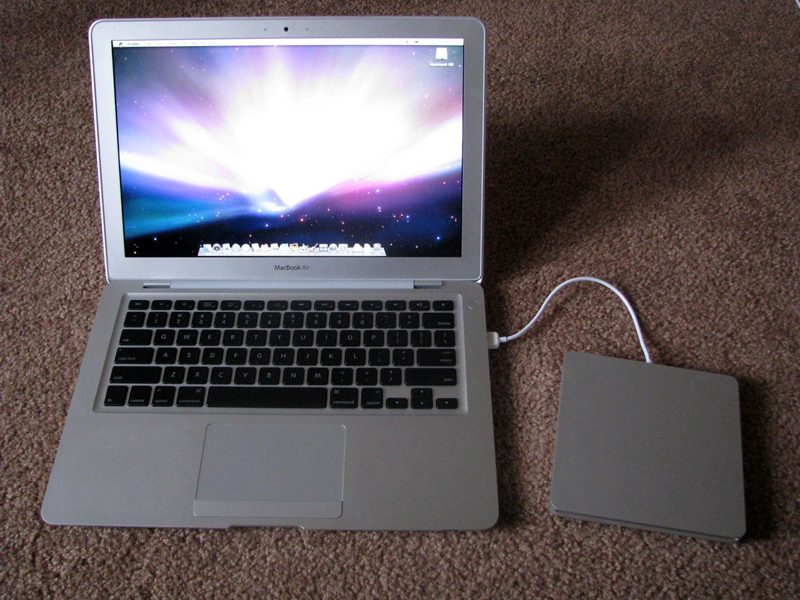 Like the MacBook Air, they supply a matching, external optical drive; the difference with the Air is that Apple suggests that its SuperDrive is entirely optional. Our previous segment on the Air's hobbled Migration Assistant noted that replacing speedy FireWire with the significantly slower and less reliable nature of networking, and particularly wireless networking, results in some obvious and serious tradeoffs. Depending on how users decide to use their Air, this may or may not be a significant problem. Anyone who plans to copy huge amounts of files from their existing system to the Air should plan to do so using a Time Machine backup or a manually created archive disk using USB. Because the Air is intended for use as a highly mobile machine rather than a workstation replacement, its limited ability to rapidly migrate files is probably less of an issue for many of its intended users, particularly when compared to the wireless alternatives to its optional optical drive. Air users might likely perform a migration only once, but will typically need to install software regularly, and may occasionally need to reinstall their system from the Mac OS X DVD or run utilities from it. The optical sharing features that Apple supplies also beg for the fastest network possible, and just as with wireless migration, no amount of slick software should be expected to turn a network into an equal rival of a directly connected SuperDrive. 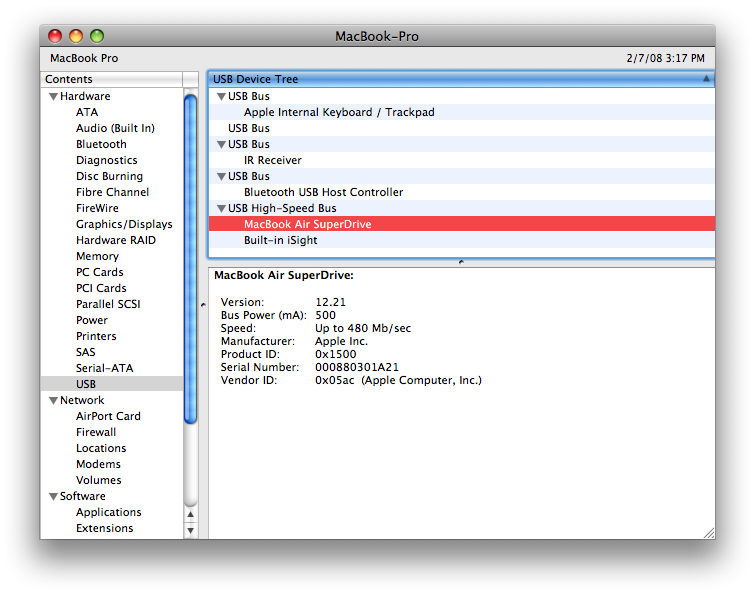 Ideally, users will spring for the $99 USB SuperDrive option for all those times when they will actually need it. However, Remote Disc and the Remote Install process, while not without their limitations, do work very well, and will benefit users whether they buy the SuperDrive or not. As great as the idea of jettisoning old technology is, the reality is that most users should probably consider getting the optional SuperDrive. It's attractive and compact, and self powered. It's also priced decently. It's extremely thin, but it still looks clunky next to the razor edged Air. With the screen open, the Air looks thin enough to fit into the SuperDrive's slot. Closed, the Air still appears thinner than the SuperDrive (below). The SuperDrive has a short cable that limits how it can be positioned, but also makes it compact and easy to carry around (below). The text just below where the cable leaves the drive is the unit's serial number, and appears designed to be read only using a microscope. There is no other label or printing anywhere on the device apart from some grey on black lettering and an Apple logo on the base. The profile of the drive next to the slim chassis of the Air makes it obvious why Apple peeled the optical drive out and offers it as an external option (below). All that appears to be missing is the software driver. It is possible that Apple is offering the drive as a loss leader convenience for Air users, and doesn't want to support the drive on other systems because it's not making any money on it. If that's not the case, it's simply a mystery as to why the new SuperDrive is Air-only, as a number of users (and employees) at the Apple Store remarked about wanting to buy it for use with another Mac. 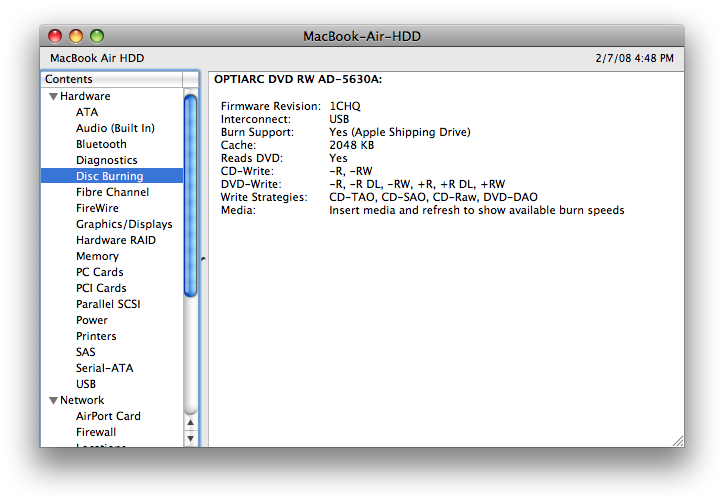 The SuperDrive shows up on the Air as the OPTIARC DVD RW AD-5630A (below). There wasn't an obvious kernel extension driver we could find that supports the SuperDrive, although the Air ships with at least two unique Extensions: AppleUSBMultitouch for the trackpad and ApplePlatformEnabler. 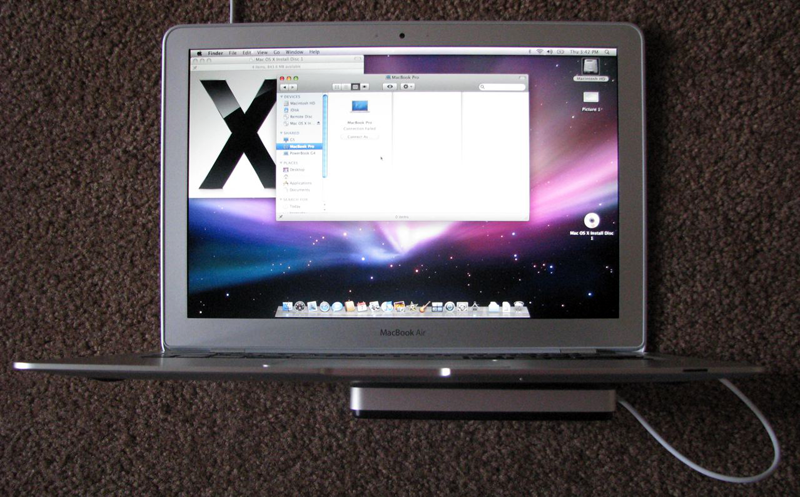 Without buying a SuperDrive, you can use Remote Disc to access files from the optical drive of another Mac or Windows PC after installing the CD and DVD Sharing software on the Air's Mac OS X Install DVD. This automatically discovers and connects to optical drives using simplified access permissions, so users don't have to set up accounts for file sharing on the host system and can instead simply turn on an option to ask permission before sharing the drive. If that option is set, the Air will pop up a request on the host system whenever it browses the host from the Remote Disc device in the Finder. With the option turned off, the disc will simply show up under the host system's computer name. Remote Disc works pretty well in theory, but some systems seemed to have a problem getting or responding to the request to use the drive. Other discs didn't work at all in certain computers, or had intermittent problems that made trying to use Remote Disc a frustrating experience. These issues need to be worked out before we can recommend trying to use the Air without having the optional SuperDrive available, but they're all software issues that can be addressed in an update. Some of the problems we experienced appeared to be related to our own network and software setup on the external computers we tested. While the Air and new Remote Disc can't be blamed for all the problems, it did seem like the Air's Finder was more likely to stop responding or beach ball and then fail to shutdown after doing some endurance testing on the Remote Disc features. Again, expect Apple to address these issues in software refinements over the next few weeks. Nearly every new model released has some period of minor problem shakedown before everything runs perfectly, from battery optimizations on earlier MacBooks to the startup firmware on the latest iMacs. One thing that won't be solved in a software update is the limitations posed by copy protected software on DVD or commercial DVD movies using CSS, neither of which can be accessed via Remote Disc. If you want to watch a DVD movie without buying the external SuperDrive, your only options are to rip the disc to standard files that can be played with DVD Player or rip and transcode it with Handbrake to H.264 and play the resulting movie file from QuickTime. Of course, Apple would also be happy to sell or rent movies to you from the iTunes Store, too.